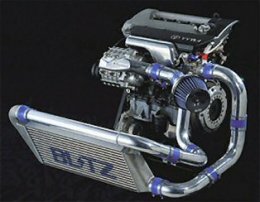 Vortech Engineering, LLC provides supercharger kits and performance products for a large variety of import and domestic cars and trucks as well as marine engines. Recently they have expanded into aeronautics with FAA Approval for a supercharger system for an aircraft engine. Vortech is an American company that was established in California, 1990. Vortech is much younger company than several industry competitors but that hasn’t slowed them down. Vortech is a major player in the supercharger world. They are credited with several innovations for the centrifugal supercharger. Some of the innovations include: The first to offer a supercharger test cell designed and operated to SAE Standard J-1723, the first to develop a centrifugal supercharger with gears, the first to use an air bypass valve in systems and air / oil mist system for cooling. Vortech has six US patents. They are the only company to receive the Specialty Equipment Market Association (SEMA) Award for Best Engineered New Product on a centrifugal supercharger an accomplishment they have achievemed three times. Vortech Engineering, LLC is a strong race supporter with Vortech superchargers and systems. At the time of writing, Vortech has racing teams in the NMRA and NMCA drag racing and Vortech parts can be found in racing teams throughout the world including jet ski and marine applications. Several world record holding vehicles have used Vortech parts. HKS provides high performance aftermarket parts for a large variety of makes and models of cars. HKS was founded in the later months of 1973 by Hiroyuki Hasegawa and Goichi Kitagawa. HKS started out in a dairy-farming shed at the foot of Mount Fuji, Japan with funding from Sigma Automotive Co., Ltd.
A year after inception HKS made history by releasing the very first aftermarket turbocharger for passenger cars. The first turbo kit was for the L20B engine from the Datsun 240Z. Along with making history with their first turbocharger HKS was the first in producing an electronic turbo timer and boost controller. HKS was a pioneer in the Japanese aftermarket performance industry and to this day continue to release a large array of performance parts including their centrifugal GT Supercharger. In 1982 HKS expanded their operations when they opened HKS USA, Inc. Further expansion developed into the UK and Thailand while products continued to be developed for both Japanese and American domestic cars as well as European models. By the late 1980’s HKS had become involved in the racing scene. They have competed in several forms of racing including drag, All-Japan Formula Three (F3), Japanese Touring Car Championship (JTCC), Super GT (Formerly All-Japan Grand Touring Car Championship or JGTC), D1 Grand Prix (D1GP), Rally, Superbikes and more. Outside of their own racing teams they remain active in sponsoring other racers who carry the HKS name. HKS continues to grow as a company and with its high quality performance offerings. HKS is currently a publicly traded joint stock company with subsidiaries now in California, USA (HKS USA), Cambrideshire, England (HKS Europe) and Bangkok, Tailand (HKS Thailand). Neuspeed provides superchargers and performance parts for Acura, Honda, Volkswagen and Audi. The company started in 1975 by Bill Neumann with his two sons Gary and Aaron. The original company from Burbank California has roots in dyno-tuning and custom engine building. In 1980 Neuspeed brought out its first Volkswagen project nicknamed “Thunder Bunny”. It was a 1981 VW Rabbit which boasted a 0 to 60 in 7.2 seconds which reportedly was the fastest front wheel drive car in America at the time. Along with the speed boost the Thunder Bunny came with some excellent handling. The Neuspeed Rabbit posted a 64.5 MPH slalom and handled better than almost every vehicle that had been tested by Road and Track and Motor Trend. The Ferrari 512 Boxer and Lamborghini Countach were the only cars to have better ratings. Throughout the 80’s the Neumanns continued their performance specialization in water cooled Volkswagens which included the Rabbit, Scirocco, Golf, Jetta, Passat, Fox, Cabriolet and Corrado. As the 80’s neared an end and Volkswagen sales were decreasing in the United States Neuspeed decided to expand their focus. With the tuners starting to take root there was an burgeoning market in Honda CRXs and Civics in South California. With excellent foresight Neuspeed expanded to include Honda and Acura to their line. By 1995 the Acura and Honda part sales were nearing that of the Volkswagens effectively doubling the size of the company. To further their Honda line in 1996 they funded a team for the North American Touring Car Championship (NATCC). The first Neuspeed race car was an Accord. It took them only to mid season to make a difference and to start wracking up victories. The Neuspeed driver, Randy Pobst, won the Drivers Championship and they took home first place in the Manufacturer’s Championship for Honda. The team also won awards for completing every race and for the most laps. In 2001 the Neuspeed Roots type supercharger kit for the Volkswagen 2.0L 8 valve engines arrived after a year of intense development and testing. This first supercharger received rave reviews for its smooth power delivery and factory like appearance. The kit received full approval from California Air Resource Board (CARB) which made it smog legal in all 50 states. By 2003 Neuspeed had grown to be the largest supplier of high performance water cooled Volkswagen parts in the United States as well as a leading supplier for Acura and Honda performance parts. Currently (2017) they are not offering any new Superchargers or Turbos that we know of.